It certainly has been an interesting year for the Word N Sound Poetry League. Pretoria came out to play…hard. Xabiso Vili and Nkosinathi Gaar have been giving Joburg poets a run for their money. Women have also been claiming their space in the slam with Bafentse, Monica Fumez and Thando The Poet gunning for the Top 5 spots. After 7 months of SA’s toughest Slam we are proud to announce the Top 10. 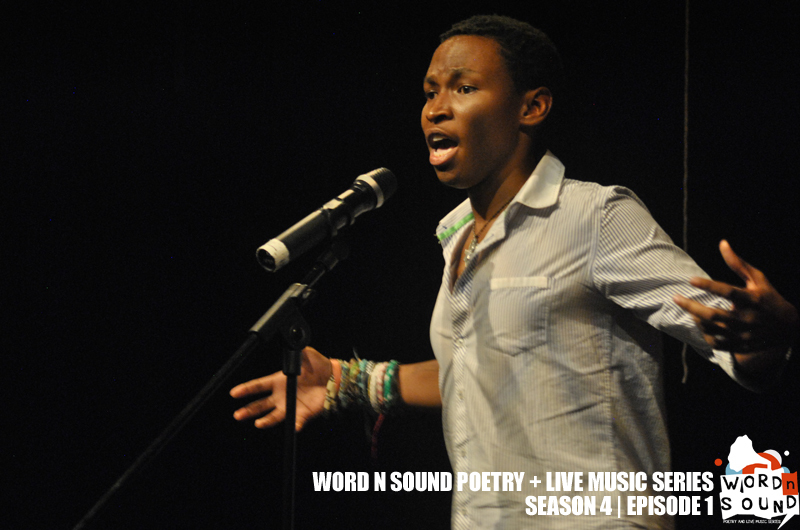 After our last Word N Sound Series show this Saturday, the Top 5 on the league will face each other at the finale at the 4th annual Word N Sound International Youth Poetry and Live Music Festival on 4 October 2014. I’ve watched the Word N Sound stage from Grahamstown then Cape Town, always wishing I would have a chance to participate. This answer might make me sound like a groupie but I promise, I’m the nice type of groupie. I was lucky enough to compete against Andrew Manyika in the 2011 DFL Lover + Another Poetry challenge – he was repping Gauteng and I was repping Eastern Cape. I really liked his work so I may or may not have started stalking him. As a result of this, I was able to discover his affiliation with Word N Sound and do a bit more research. I’ve watched the Word N Sound stage from Grahamstown then Cape Town, always wishing I would have a chance to participate. Luckily I moved to Pretoria last year and thus was quite excited for the beginning of the season. Nkosinathi and I always enjoy tough competition, so a poet had to do what a poet had to do to book their slot on the competitive WordnSound open mic list. 2. 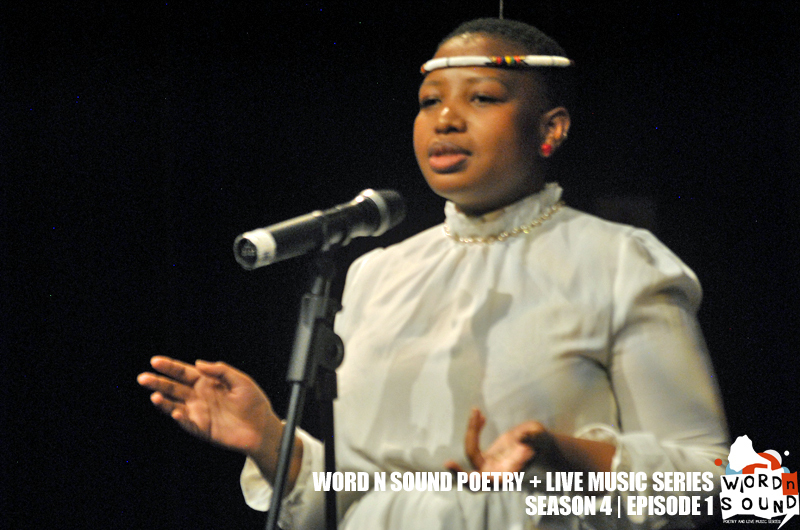 How was your first experience on the #WordNSound stage and what do you think of the rest of the poets who performed? It was an absolutely beautiful experience. Filled with so much talent, love and devotion to the word. The featured artists and the award winners were world class entertainers and writers. The open mic-ers also brought so much fire to that microphone. I hope that those performances continue to inspire those who, perhaps, didn’t do too well on the stage along with those that were to apprehensive, scared or nervous to get up onto that stage. There are very few better experiences with sharing a stage with poets of that calibre. 3. What did you hope the audience would walk away with after listening to your poem (please may you give me the title)? The title is ‘Kintsukuroi’. I am always a bit apprehensive about telling the audience what to feel when it comes to artwork. The things we walk away with are always so different and I would really want them to keep and nurture whatever feeling they had, that will be true to them. For me, when I first performed that poem, I was reminded of our strength. In the face of adversity, pain, horror, grief, I find it amazing that we continue to rise time and time again. That strength that is always beside and inherit within us is beautiful and I use that poem as a reminder to myself of that strength when situations in life get a little too difficult to handle. 4. Which line stands out the most in that poem even for you as its writer and why? Let me state that I love all my poems equally and every single line thereof just as equally. I choose the above line because all the other lines have worked together to create its potency. I enjoy the above line because of its violence, its pain, its agony in the context of the beauty of ‘Kintsukuroi’, it creates an ugly with all of it’s beauty. A contrast of this beautiful thing happening through all this pain, rawness and agony. That is the type of writing I want to do more of. 5. Tell us a bit about you as a writer. When did you start? Why? What do you hope to achieve as a writer? I was always an awkward child, spent most of my time reading, not talking, playing in my imagination. It was ten years ago, in Grade 7 I think, that I heard a poet perform for the first time, i ran home after school and penned my first piece called ‘African Stranger’. When I came back to school the next day or a couple of days after, I showed it to my teacher who asked me to perform it to the class and then the other classes. I had somehow found a way to take all my awkward imagination living and share it with the world. As I performed, I cried and i’m sure I felt little wings growing from my ankles and I flew across universes that day. i still believe that poets and storytellers are from the same bloodline as Hermes and remain the messenger of the gods. In the future, I envision a South Africa infused with art. Performers on every street corner. Alternative stage popping up where anybody has the artistic intent. I imagine a mass sharing of beauty, workshops and a constant improvement of the art form because of the artistic interaction. Throw in some money in there and we have a perfect dream. I imagine kids telling their parents they want to be artists and parents responding as though the child just said they want to be a fire fighter or a lawyer or doctor or a space travelling philanthropist politically aware superhero. 6. What can we expect from you next month? I am still poking around as to what can and cannot be done on the Word N Sound stage. So next month I plan to experiment. Take a little risk, play around with the art form in the hopes of introducing new elements to my performance. So as much as I have looked at the judging criteria when writing my piece, I have also tried to create an authentic story telling experience. Really, I am following my mantra, taken from Chuck Wendig, to always “ART HARDER MOTHERF***ER”, so I hope to always be better than I was last time. With just over a week to the final round of the open mic before the grand finale in October, my inbox is flooded with requests for the current league standings. The Top 10 in the league will all perform at the Word N Sound Festival on October 6. However, only the Top 5 compete for the ultimate crown of 2012 Word N Sound Open Mic Champion. So far here is your line up for the Festival (of course things could…no, will change after our show next Saturday, September 1. There are at least 150 points that will be awarded at the finale so its still an open game. Good luck to everyone entering the Open Mic next week. See you Saturday 1 September for a beautiful Spring Day with KB Kilobyte, Mpho Khosi and Kagiso Tshepe. R500 up for grabs for the best poem on the open mic courtesy of BlackCouch Sofserv Aaah Whuuuu!